CNC high precision Motorcycle Engine parts - TAIWAN GREATEK TECHNOLOGY CO., LTD.
TAIWAN GREATEK TECHNOLOGY CO., LTD.
We provide professional services including CNC lathe, CNC milling, 5-Axis Machining Centre, and CNC compound machining. We also received quality certificate of ISO 9001. And through our integrated management system and professional personnel, Taiwan Greatek Technology Co., Ltd. (GTC) is confident to be customer oriented in every aspect. GTC is an OEM factory, a custom-made order is acceptable. 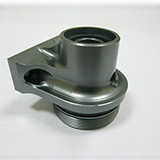 Our goal is manufacturing excellent products that conform to our client’s demands. Business concept: To offer a fair and reasonable price To reinforce quality and technology To efficiently satisfy customer needs To provide customised services SERVICE TEAM Through our integrated management system and professional personnel, TAIWAN GREATEK TECHNOLOGY CO., LTD is able to offer customers with rapid service and high-standard products. All our personnel are selected by a normalised system, and have to take intensive in-service trainings before they get into the field; our supervisors must face rigorous challenges and attend occupational training programmes so that they are able to lead; our senior managers are capable of analysing circumstances inside and outside the company, equip with a explicit development plan for the company, and always remind all personnel to satisfy customers by implementing their requirements. TAIWAN GREATEK TECHNOLOGY CO., LTD is always striding ahead to be a reliable, life-long partner to all customers. The cornerstones of our success are the use of professional technology, excellent service, and innovative designs. These have helped us establish a global sales network and the support and trust of these customers have helped TAIWAN GREATEK TECHNOLOGY CO., LTD. become a respected name within the CNC high precision Motorcycle Engine parts industry. we respect the privacy of our customers and all information given to us is kept strictly confidential. Exhaust Tip made with aluminum with chrome plating. Taiwan Greatek Technology provide the best of Automobile Exhaust Tip(CNC Motorcycle parts). Suspension system made by aluminum with colour anodising. 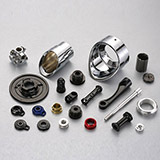 GTC has high quality of CNC high precision Automobile Shock Absorber(CNC Motorcycle parts). We have a well maintained quality management comprising a team of experienced professionals that keeps an eye on every individual CNC high precision Motorcycle Engine parts to ensure durability. To reach many people, our products must be of good quality and affordable. We design with our customers’ needs in mind.